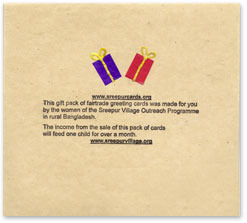 Limited edition handmade charity greetings and christmas cards from Sreepur Village. 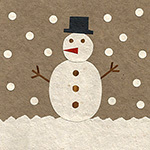 Sreepur Cards are totally handmade, from the paper to the individal card designs. 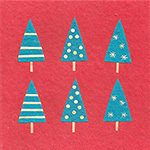 This means that our card packs are a limited edition. To avoid disappointment buy now! You can register for our priority contact list enabling you to be given the first opportunity to buy our new cards as they are released. Send an email to orders@sreepurcards.org with the subject line "Priority". 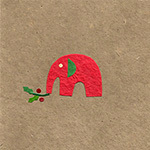 We wanted to present our handmade cards in a way that makes them a nice gift for someone you care about, or even for yourself. It seemed silly to buy packaging when we already have the skills to make our own by hand. So we have created a handcrafted presentation envelope made from card produced in the village. Each envelope is then individually finished with a handmade motif and a messsage explaining about the card production and charity value of these unique handmade cards. A perfect gift - for yourself or someone you care about. Sreepur Cards - cards that show you care.